"This book is helpful to anyone wanting to explore the concepts of drawing down, aspecting or possession, dealing with the disincarnate, and plumbing the concept of magical contacts. Dominguez also gives advice on helping others through such experiences, making this a valuable resource for teachers, priestesses, and counselors. There is information here that I, in 25 years of magical study, had not readily encountered before." "This is the `nuts and bolts&apos; of working with spirits. Mr. Dominguez covers it all in depth--from explaining the different forms of spirit, the different levels of working relationships, and the different types of contact we can experience, to successfully connecting to and separating ourselves from spirits. With clear separation of fact and fantasy, very detailed discussion, and solid-based research, Mr. Dominguez presents the community with a working textbook on spirits." If you do magic, pray, or venerate your ancestors, you are working with spirits. If you seek information or guidance through channeling, through mediumship, or through the words and visions of mystics, you are also working with the beings of the subtle realms. 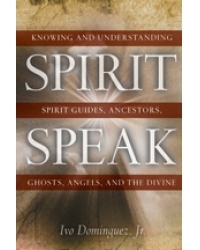 A hidden classic in many spiritual communities for years, Spirit Speak is now available with new material and fresh insights. Ivo Domínguez, Jr., has been active in Wicca and the Pagan community since 1978 and teaching since 1982. He serves as one of the Elders of the Assembly of The Sacred Wheel, a Wiccan syncretic tradition that draws inspiration from astrology, Kabbalah, the Western Magickal Tradition, and the folk religions of Europe. His techniques and insights are rooted in a synthesis of traditional metaphysical teachings, modern science, and memories of past lives.